It must be. Social media says so. Certainly, 2016 had its share of serious issues. From escalating problems in race relations, to horrific acts of terrorism, to the ravages of war in places like Syria, and more. Innovation has more room to breathe when we’re operating within God’s seasons instead of on our schedules. God doesn’t work on our calendar. He created days, weeks, months, seasons and years. Those are real things. People designed minutes, hours, decades and New Year’s Day on January 1. Those are made up things. If Christmas comes and goes without a red cup scandal, did it really happen? We made it through this Christmas without a major national brouhaha erupting about a not-holy-enough red cup, banned lyrics at a school play, or a disallowed manger scene. Speaking effectively has more to do with how well you listen than how much you talk. That was one of the greatest compliments I’ve ever received in ministry. It happened after speaking at a Prayer Breakfast at a US Army base in Germany that was in the process of being closed. Acts 2 does not give us a picture of Peter hearing from God in private, then coming to the disciples with the vision. Have we been doing vision-casting wrong? I think so. For maybe a generation or more. Some of my worst disasters in ministry have come from trying to implement a vision, only to find out that no one else was buying into it. Long-term pastorates are almost always good for the church and the pastor. But when these things happen, it's time to go. It’s one of the toughest questions a pastor has to face. Pastoring isn’t easy. There will always be difficulties to address and bad history to overcome. But most pastors are in it for the long haul. Innovative leadership should constantly drive us to communicate eternal truths in fresh, new ways. The tagline for this blog is Innovative Leadership from a Small Church Perspective. New readers often ask what I mean by innovative leadership, so today’s post is designed to answer that question. When someone sneers "A pastor that helps you define anything other than who would lead a committee! HA! Good one," let's listen before responding. Are pastors supposed to be shepherds any more? Or is that idea passé? If so, have we replaced it with something better? Or worse? What if we had some raw, unsolicited opinions from the people who matter? Namely, the people in our churches – or those who have left. Does Jesus Want Every Church to Be a Big Church? Let’s stop arguing about which church size is best, and start seeing what’s best about each size. I agree. How can I not? Jesus was the one who said, “I will build my church,” and I’ve found that arguing with him is not a recipe for health or happiness. When people come to your church this Christmas season, they want to hear the story of Jesus. Give them what they came for. “Keep Christ in Christmas” is a familiar saying this time of the year. But you don’t expect to hear it from the local rabbi. 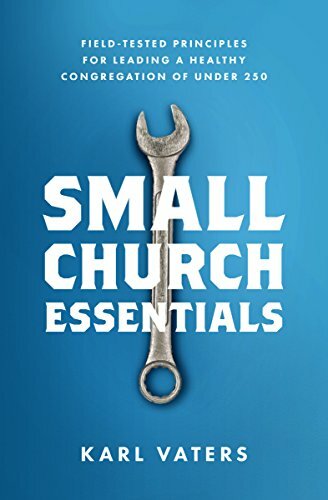 The vast majority of churches are small, so we need small church alternatives to big church solutions. How many times have I said that while shaking my head after attending a conference or reading blog posts and books about church leadership? I could write a book. Even with the arrival of megachurches, small churches are the primary way people choose to worship Jesus. Why are there so many small churches in the world? Ninety percent of churches have fewer than 200 people. Eighty percent have under 100. Small churches are not in the minority. We are the overwhelmingly dominant way people have always chosen to worship Jesus. It's important to distinguish between personal preferences and moral absolutes if we hope to maintain our integrity. I hate opera. And Brussels sprouts. And spiders. But I'm glad they exist. Because they all serve important functions. Saying I don't like something is not the same as saying it's bad. If we’re only hearing from people who think like us, we're missing out on a lot. Politically, theologically and relationally. I have friends I’m not supposed to have. From every imaginable political, theological, social, ethnic background, and more. People with whom I have radical, even angry disagreements. Yet they remain my friends. There are some simple ways to tell the difference between a boss and a servant leader. And they come from the example of Jesus. The church needs fewer bosses, more leaders. And even more servants. In the pulpits, not just the pews. Sadly, too few people in positions of authority know the difference between being a boss or being a leader. Mostly, because we haven't grasped servanthood.